U.S. Army Garrison-Pohakuloa is seeking public comment on its 2017 Draft Integrated Cultural Resource Management Plan regarding the 132,000-acre Pohakuloa Training Area, located in the saddle between Mauna Kea and Mauna Loa. The document states, “the general objective of the cultural resources management program are to eliminate impacts to the military mission arising from cultural resources.” Despite adverse impacts to archaeological resources and sacred sites, the Environmental Assessment concluded a Finding Of No Significant Impact. For this reason, USAG-Pohakuloa has declined to hold public meetings as it is not legally obligated to do so under a FONSI, despite “active public outreach” having been included as an Implementation Objective of the ICRMP. Malu ʻAina Center for Non-Violent Education and Action will be hosting community meetings concerning this plan in lieu of USAG-Pohakuloa, co-sponsored by Hawaii County District 5 Council Member Jen Ruggles. The Hilo meeting will be held on November 30, 2017 at the Aupuni Center Conference Room from 5:30 pm to 7:30 pm. The Kona meeting will be held on December 1, 2017 at the West Hawai’i Civic Center in the open gazebo from 5:30 pm to 8:30 pm. Community members attending in Kona should bring a chair or towel for comfortable seating. Written testimonies, songs, chants and art are welcomed. Testimonies will be video recorded, shared on social media and submitted to U.S. Army Garrison by the December 7, 2017 deadline. The EA can be found at https://www.garrison.hawaii.army.mil/NEPA/Documents/USAG-P_ICRMP%20&%20EA_Draft%20FNSI_revised.pdf and can submit comments. Comments can be emailed tousaghi.pao.comrel@us.army.mil or mailed to: Directorate of Public Works, U.S. Army Garrison, Hawaii Environmental Division (IMHW-PWE) 947 Wright Ave., Wheeler Army Airfield Schofield Barracks, HI 96857-5013. 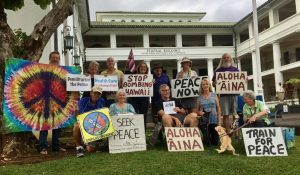 Join the Hilo Weekly Peace Vigil! Police Threaten “Jaywalking” for Leafleting! Each week a new peace leaflet is prepared for distribution via the internet and paper copies handed out at the vigil. On Friday, Nov. 24 Hawaii County Police officers, P. Rose, badge #398 and C. Antonio, badge #380 showed up at the Hilo Peace Vigil. The officers said they had received a complaint of people handing out leaflets in the street. No name of who complained was identified. Jim Albertini gave the officers the weekly leaflet. Jim was asked for identification info –name, age, DOB, address (mailing and physical address), last 4 digits of SS #. Officer Antonio, who was the senior of the 2 officers, said it is jaywalking to step off the curb to offer a leaflet to drivers of cars stopped at the red light heading south on one way Kino’ole St. The officers said they will cite Jim for jaywalking if they have another complaint and observe Jim off the curb leafleting to drivers in stopped cars. In the past 844 weeks at least 250,000 leaflets have been handed out on the corner of Kino’ole and Waianuenue St. to passing motorists. People are greeted with “Aloha” and thanked for taking a leaflet. People are encouraged to sign up at our www.malu-aina.org website to receive new posts electronically and to pass our leaflet/website on to friends. There is an increasingly repressive atmosphere growing in the U.S. towards peaceful free speech expression. While peace activists are threatened with “Jaywalking” for just stepping off the curb to offer peace leaflets to drivers of stopped cars at the traffic light, other “jaywalkers” are ignored. Each week dozens of people cross the street in the middle of the block from the post office, and other places throughout Hawaii, who are not threatened with jaywalking citations. Meanwhile, the U.S. is waging war and special ops in numerous countries killing and injuring millions, and now threatening nuclear war. In this climate of repression and war it’s becoming more difficult to even hand out a leaflet of dissent. Work for Justice, Peace & the Earth! Support Free Speech! U.S. Army Garrison-Pohakuloa is seeking public comment on its 2017 Draft Integrated Cultural Resource Management Plan regarding the 132,000-acre Pohakuloa Training Area, located in the saddle between Mauna Kea and Mauna Loa. The document states, “the general objective of the cultural resources management program are to eliminate impacts to the military mission arising from cultural resources.” Despite adverse impacts to archaeological resources and sacred sites, the Environmental Assessment concluded a Finding Of No Significant Impact. For this reason, USAG-Pohakuloa has declined to hold public meetings as it is not legally obligated to do so under a FONSI, despite “active public outreach” having been included as an Implementation Objective of the ICRMP. Malu ʻAina Center for Non-Violent Education and Action will be hosting community meetings concerning this plan in lieu of USAG-Pohakuloa, co-sponsored by Hawaii County District 5 Council Member Jen Ruggles. The Hilo meeting will be held on Thursday, November 30, 2017 at the Aupuni Center Conference Room from 5:30 pm to 7:30 pm. The Kona meeting will be held on Friday, December 1, 2017 at the West Hawai’i Civic Center in the open gazebo from 5:30 pm to 8:30 pm. Community members attending in Kona should bring a chair or towel for comfortable seating. Written testimonies, songs, chants and art are welcomed. Testimonies will be video recorded, shared on social media and submitted to U.S. Army Garrison by the December 7, 2017 deadline. Two Hawaii County Police officers, P. Rose, badge #398 and C. Antonio, badge #380 showed up around 4:15PM at the Friday, Nov. 24th Hilo Peace Vigil at the downtown Post office, our 844th consecutive weekly vigil. The officers said they had a complaint of people handing out leaflets in the street. No name of who complained was identified. Officer Rose spoke to me. I gave the officer the weekly leaflet dated Nov. 24, 2017 we were handing out plus another leaflet also being distributed about the Nov. 30 and Dec. 1 community meetings on the Pohakuloa Cultural Impacts Environmental Assessment. The officer asked me for identification info –name, age, DOB, address (mailing and physical address), last 4 digits of SS #. Then officer Antonio, who was the senior of the 2 officers, joined in the conversation and said it is jaywalking to step off the curb to offer a leaflet to drivers of cars stopped at the red light heading south on one way Kino’ole St. He said they will cite me for jaywalking if they have another complaint and observe me off the curb leafleting to drivers in stopped cars. As the 2 officers drove off (driver P. Rose) I noticed the license plate of the police car had a “combat vet” license plate, causing me to wonder if the complaining person of our peace leafleting was the officer himself. If anyone has any ideas for an arm extension for leafleting so I don’t have to step off the curb, it would be appreciated. In the 844 weeks I have been leafleting, I estimate I have handed out at least 250,000 leaflets on the corner of Kino’ole and Waianuenue St. to passing motorists. The document says “the general objective of the cultural resources management program are to eliminate impacts to the military missions arising from cultural resources.” Shouldn’t that be the other way around — eliminate impacts to cultural resources from military missions? The military often has things backwards. PS Reminder of meetings coming up In Hilo and Kona. If you can’t make the meetings shown below you can see the EA here https://www.garrison.hawaii.army.mil/NEPA/Documents/USAG-P_ICRMP%20&%20EA_Draft%20FNSI_revised.pdf and can submit comments. Comments can be emailed to usaghi.pao.comrel@us.army.mil or mailed to: Directorate of Public Works, U.S. Army Garrison, Hawaii Environmental Division (IMHW-PWE) 947 Wright Ave., Wheeler Army Airfield Schofield Barracks, HI 96857-5013. Call for a full Environmental Impact Statement: Stop the Bombing, Clean Up and leave!